Saranggani Bay Festival is said to be the biggest beach festival in Mindanao. 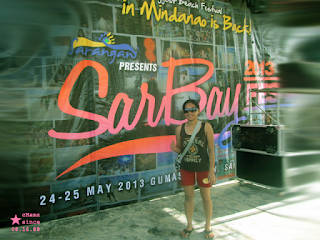 For SarBay Fest 2013, the party was organized and made possible in Gumasa, Glan (same in the year 2012). It was my first time to attend a beach party and I can say that it was great experience. My first time to walk on the most crowded seashore. Everyone was partying hard, enjoying each others company, drinking all night until they drop, dancing in the tune of reggae music and dance-party music. The fireworks display amazed me for I have not seen one for a decade already, just from the Television. Fireworks are banned in Davao City for more than a decade already.